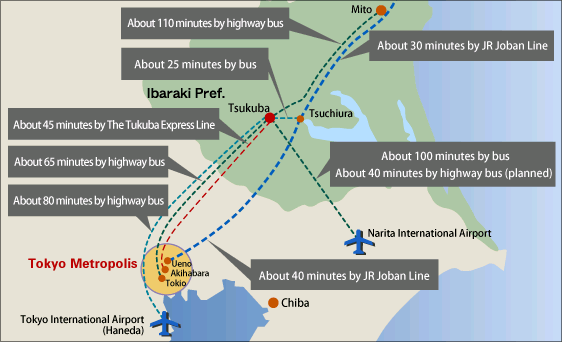 The easiest way to go to Tsukuba is to take a Bus connected from each airport terminal. For other accesses to Tsukuba, please see below. It takes about 100 minutes / 2,540 JPY by Bus. Please get off at the Tsukuba Center. About Bus Stops, please refer to Narita International Airport website. About Time Tables and Fares, please refer to Kanto Railway Co., Ltd. website. It takes about 80 minutes / 1,800 JPY by Bus. About the details, please refer to Tokyo International Airport (Haneda Airport) website. About Time Tables, Bus Stops and Fares, please refer to Haneda Airport Bus website. 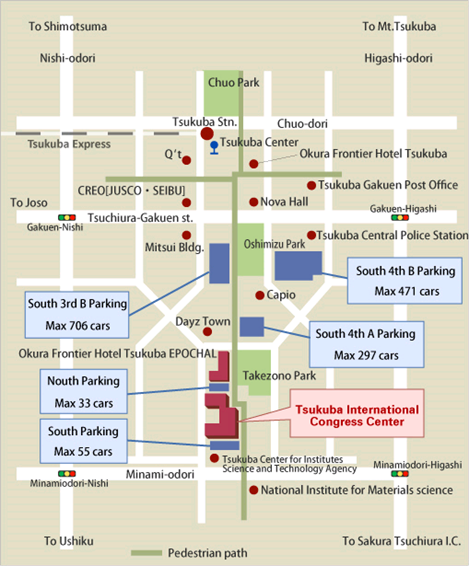 From Tsukuba Center to the venue, please see the following map. Go strait along the pedestrian path. It takes about 8 minutes on foot.